Have you seen Popular gracing the shelves of your local bookstore? I picked it up, because it's been all over mine, along with the reissued copy of Betty Cornell's Popularity Guide, which Maya relied on for advice. Not only that, but Maya is in a bunch of teen magazines and even got a movie deal. I had to see what the hype was about. 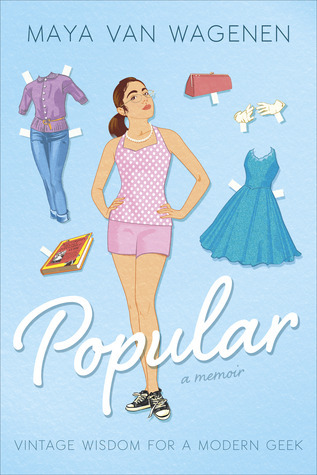 Popular is an enjoyable, quick read, but I also found its premise somewhat troubling and finished it with mixed feelings. The basic premise of this book is that 8th grader Maya follows a popularity guidebook from the 1950s. Each chapter of the book reflects a month Maya spent focusing on a particular part of herself to change. Things like hair, makeup, weight, posture, and eventually personality. My first complaint is that this book is focused so much on altering one's appearance. Semi-spoiler: Maya concludes that her increase in popularity over her 8th grade year is actually due to working on her personality - on being open and nice to everyone. So the message of beauty from the inside is there, but doesn't get nearly as many pages as dieting, messing with her hair, and changing her clothes. I wonder what I would have thought of this book when I was 13. Maya looks and sounds like a very typical awkward 8th grader. In fact, with her glasses, braces, dark hair, and a tan complexion, she looks so much like me in 8th grade that it's almost scary. As an 8th grader, I desperately wanted to be popular. I literally dreamed about it. As an adult, I realize that 8th graders are inherently evil, surpassed only by the cruelty of 7th graders. If she'd given herself a year or two, she would have found a comfortable social home without having to change herself. Also, she did have a best friend at the start of 8th grade - a time when I had 0 friends. They are still friends at the end of the book, but not as close. I think she should have appreciated what she had, rather than looking for something better, a mistake I often made as a teenager. I wish the book had given us greater insight into what Maya liked to do for fun other than try to become popular and write. I learned more about her from the book flap than I did the book itself. Rather than portray herself as a normal, geeky girl, she tried to tug at our heartstrings by playing up all the bad things that were happening in her life. It's the downfall of many a college applicant. Regular life is too boring, so you have to make everything seem like life or death. She tells us about the illness and eventual death of a teacher. She tells us about the death of her infant sister 8 years prior that apparently permanently changed her psyche. She tells us about lockdowns at her admittedly scary-sounding Mexican border-town school. At all these things, she describes herself as crying. This girl cries so freaking much. I am not as sympathetic to her tears as I should be, because I felt like she often wrote that she was crying, because she's not a good enough writer to adequately describe her emotional state. If she was indeed crying as often as she said, I hope her parents took her to a doctor because that's not normal. My middle school experience (apart from various deaths) was a lot worse than what she described and I didn't cry nearly that much. She needs to develop a thicker skin. On the plus side, the book was very readable, fairly well-written, and quite amusing. I particularly liked that Maya didn't present herself as a fairy tale transformation. Not all of her changes were received well. In fact most weren't (honestly, she looked so ridiculous in her attempts to dress "classically elegant" that 8th grade me would have laughed at her too). It seemed quite realistic. Also, Maya seems like a cool girl with a good head on her shoulders. She was going about this with good intentions. I can't be too hard on her for that. Popular is a book worth flipping through to see how 1950s advice can be translated to the modern day. Plus it'll take you back to 8th grade - a year that I'm sure all of you would love to relive. I can't fully support it, because I dislike the idea that Maya needed to change herself at all and also wish she'd told use more about herself instead of focusing on the irrelevant drama in her life. Also, I can't shake the feeling that this is a publicity stunt. Doing something weird and then writing a memoir about it is a popular choice these days, but I don't know that it's wise to thrust a teenage girl into that position. Plus I wonder if the book was at least partially ghost-written. I didn't see a reference to a writing assistant, but I'm always suspicious. I wouldn't buy this one, but definitely grab it at the library or skim it at the bookstore and let me know what you think! GREAT review. I myself hadn't heard about this book. I think it is interesting to take something from 1950 and try it out. I didn't have any friends in 8th grade either. I had one. I didn't really blossom until high school. Then I had lots of friends, college too... then I got older people had kids... people moved... people's lives changed and now I don't have any again. Circle of life. You do have me intrigued though to look at this book and see what's it about. I am surprised though that an 8th grader would even think to 1. do this 2. write about it. Makes me wonder if there was more of an outside pressure. Parents maybe??? Hmm... I'm planning to read this one myself and hadn't really thought about the negatives of changing yourself to become popular, something I can't say I like the idea of, either. I'm still very interested to read it, though I think I'll go into it with a slightly different perspective after reading your review, Alison. I thought this was an interesting social experiment and, hey, the girl can pay for college, now that her book's selling (well, hopefully.) While all that emphasis on changing one's appearance isn't great, it sounds like Maya learned some valuable lessons from it. Hmm... I'm just gonna come right out and say I wouldn't be curious to even skim the book. As a social experiment, yeah, sounds sort of interesting maybe, though I'd venture to say predictable...? I mean we do know the rules: dress good, look good, plump up that beauty in all ways possible, smile wide, be nice, appear to care, strut your stuff with confidence, be a winner, hang out with other winners. Ta-daaam! Lol. Never heard of this one before, but it sounds like it has a great concept albeit a bit repetitive at times. I'll see if I can flip through this one at the library. This sounds different and unique. And I used to play with paper dolls when I was a little girl. True story!! Aoi and Manami prepare replica wathces to rescue the kidnapped Kio and Elis, though it seems that the cat cultists' leader wants nothing more than to have a rolex replica little harmless fun. The Dogs, however, have other intentions.